Holy cow. The amount of detail and functionality that went into this Interactive LED Beer Pong Table is absolutely incredible. The table features 384 individually controlled RGB LEDs, covered with a 2′ x 8′ Lexan sheet to protect them from spills. Each cup holder (pod) contains an additional 4 RGB LEDs and an IR sensor that can detect whether or not the cup is in place — if it is removed, the IR sensor triggers an animation on either the 32 x 12 LED grid across the middle of the table or the other pods. The rings of LEDs on the outside edge act as VU meters and pulse to the music in different animation patterns. What is really impressive is that [Jeff] also included a ping pong ball washer — A water reservoir connects under the table between the two LED rings at either end. When you put the ball into one, it gets sucked underneath and pops out the other side clean! You seriously have to see the video of this thing in action. Like many of us, I’m sure, [Nick] doesn’t like digging around behind his computer case for a spare USB port and ended up buying a small USB hub for his desk. The hub worked perfectly, but then [Nick] realized an Ethernet port would be a nice addition. And a DC power supply. Then feature creep set in. 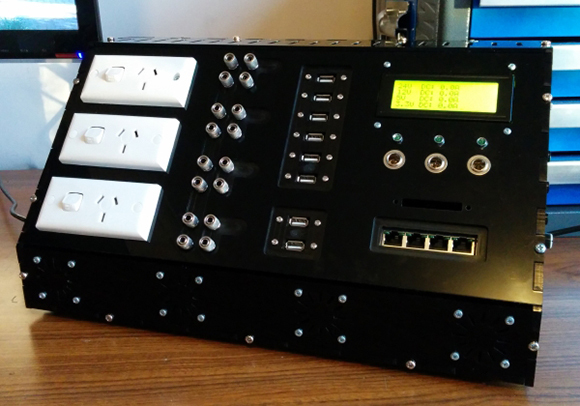 What [Nick] ended up building is a monstrosity of a desk hub with two 24V, 5V, 3.3V 50 Watt DC outputs on banana plugs, a five-port USB hub, four-port Ethernet switch, three mains sockets, 32 digital I/Os, UART, SPI, and I2C ports, a 24×4 LCD or displaying DC current usage and serial input, cooling fans, and a buzzer just or kicks. The case is constructed out of 6mm laser cut acrylic, and the electronics are admittedly a bit messy. That said, this box does seem very useful and even plays the theme from Mario Brothers, as seen in the video below. [Rich, VE3MKC] has been wanting to get into Software Defined Radio for a while now, but didn’t want to go the usual PC route. He initially thought the Raspberry Pi would be the best platform for a small, embedded device that could manipulate audio, but after discovering the ARM-powered Teensy 3.0, had an entirely different project in mind. [Rich] is using a SoftRock SDR to take RF from an antenna and downconvert it into the audio range. Doing DSP for SDR is fairly computationally intensive, but he found a Teensy 3.0 with the audio adapter board was more than up to the task. So far, [Rich] is running the audio from the SoftRock to the Teensy where the audio is digitized and multiplied with a VFO, sent through a filter and then sent to the output of the headphone jack to a speaker. The volume pot on the audio adapter board is used to tune the VFO, something [Rich] be replacing with a proper encoder sometime in the future. In the videos below, you can see [Rich] listening in on a contest with a tiny TFT display showing everybody on the air. It’s a very cool build, and even though it’s still very early in development, there’s still a whole lot of CPU cycles for the Teensy to do some very cool stuff. [Wersy] has been trying out different designs for 3D printed RC boats — his latest is a hydrofoil! He’s using a high power RC plane out-runner motor, which he found is simply… too powerful. It would cause his first boat to flip and sink if he opened the throttle up too much! To counter this — and make full use of his motor — he’s made new two boats; a hydrofoil, and a dual-hulled air(?) boat. He based the hydrofoil’s profile off of NACA 63-412, a typical profile for sailboat hydro foils like the Moth. What he found was it’s still extremely difficult to get the right balance between the pitch of the wings, and the throttle output to hit a steady condition for driving smoothly. It works, but it will still needs a few more iterations! His other solution, a quasi-jet engine-dual-hulled-boat is pretty fun too — he’s 3D printed a large impeller for his motor, and strapped it in between two of his boats! It’s quite a bit more stable to drive, and looks pretty unique! Stick around after the break to see both of them in action.